Denver, CO — Meeting on the Mountain, a new collaborative recording and live broadcast experience, kicks off their inaugural event on Sunday, March 1, 2015 at 7pm at Cervantes’ Other Side in Denver, CO. 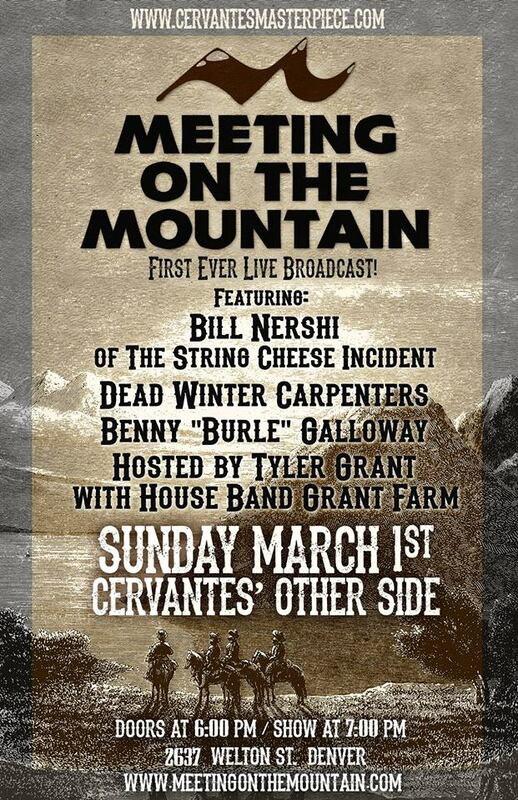 Joining host band, Grant Farm, for this first Meeting on the Mountain are Bill Nershi of The String Cheese Incident, Dead Winter Carpenters, and Benny “Burle” Galloway. The rousing live one-hour broadcast includes performances as well as interviews with each act and gives Grant Farm the opportunity to collaborate with some of their favorite musicians. There will be five installments of Meeting on The Mountain in 2015 featuring a variety of artists. Each event is hosted by Tyler Grant with The Grant Farm as the house band. It will be recorded, video-streamed live, and rebroadcast at meetingonthemountain.com. The broadcast is followed by a concert with sets from each band. Get your tickets and join them live, or if you are far from Denver tune in the live video stream at meetingonthemountain.com. Bill Nershi has delighted countless fans as a guitarist, vocalist, songwriter and founding member of the String Cheese Incident, Honkytonk Homeslice and The Emmitt-Nershi Band, and has performed from the saloons of Telluride to the some of the most sought after venues in America . 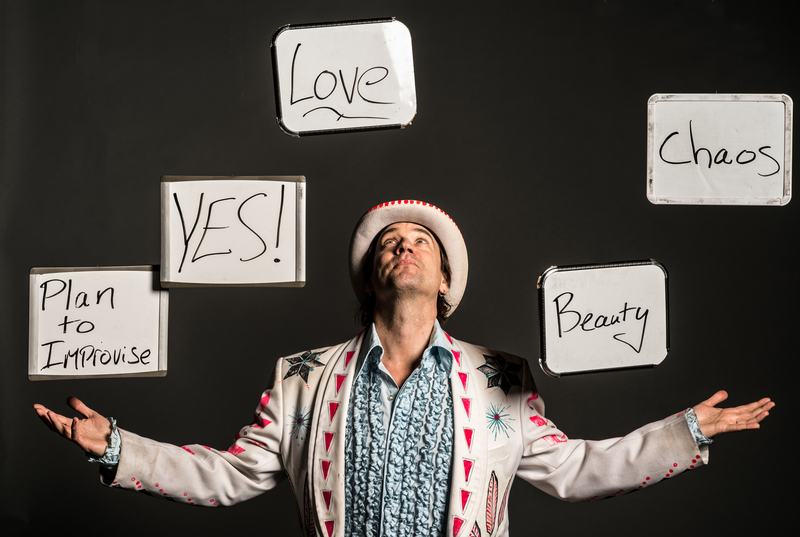 A seasoned veteran of flat-picking and a variety of acoustic styles, Bill adds a unique, colorful perspective to virtually any musical situation he encounters, and his enthusiasm and playful spirit encourage an interactive, participatory experience for musicians and fans alike. Billy still calls Colorado home and when he’s not on tour he is writing, recording and producing in his own studio, The Sleeping Giant. Dead Winter Carpenters, hailing from North Lake Tahoe, CA, represents everything the American west stands for. The band seamlessly blends Americana with roots rock and a tinge of straightforward ‘tell-it-like-it-is’ alt. country for hard-hitting performances that are as edgy as they are whimsical. The project pushes and pulls at musical boundaries with top-notch, live performances while walking the line with unexpected world music flair. With an unbridled spirit, and an authentic approach to the art of songwriting, the five-piece captures the freedom of the road with the kind of energy that is made of legends. The five-piece outfit consists of fiddler/vocalist Jenni Charles, upright bassist/vocalist David Lockhart, guitarists/vocalists Jesse Dunn and Bryan Daines, and drummer/vocalist Brian Huston. Benny “Burle” Galloway, resident colorado songwriting collaborator and musician who’s first experience at Telluride Bluegrass Festival in 1978 set off his embracement of what true American music stood for. Having moved to Denver in his teens with a guitar and a stack of records, Galloway found the area teemed with progressive sounds, plenty of like minded people to play music with, an abundance of music friendly events, and places to pick and sing. After hearing Hot Rize, John Hartford, Norman Blake, New Grass Revival and Leon Russell, it was evident to “Burle” that he had just found a deep well from which to draw new musical ideas and directions. Burle absorbed every sound available from rock to gospel and began crafting his powerful songwriting skills. The sights and sounds of the country, no matter what part of the country, are what remain the backbone of his compositions. His lyrics spawn melodies that sound like they’re one hundred years old. Colorado’s Front Range was (and still is) a hot-bed of acoustic music,Jams, festivals, and pickin-parties with Burle right in the middle of it all, writing and recording vast amounts of material. As the years passed, Burle found himself working with new and established performers as a member of roots bands, duos, trios, four pieces and more. A lot of these musical situations were built around his tunes, featuring him as a front man, a lead vocalist, guitar and/or bass player. In the past decade, Burle has collaborated and played with the finest of musicians and bands in America. His longtime producer and friend Sally Van Meter, Scott Law, Nick Forster, Jerry Douglas, Yonder Mountain String Band, Danny Barnes, Larry and Jenny Keel, Darol Anger, Sam Grisman, John and Rebecca Frazier, Rob Wasserman, Shawn Camp, Jon Wiesberger, Travis Book, Mark Epstein, Robin Davis, Jon Stickley, Tyler Grant Jordan Ramsey, Pete Kartsounes, The Infamous Stringdusters, Leftover Salmon, Great American Taxi, Emmitt Nershi Band, Head for the Hills, The Grant Farm, Broke Mountain, The Wayword Sons, Town Mountain, Espresso! The Grant Farm train stops at all stations on the North American roots music line, and is not afraid to let the whistle scream with some blistering jams. After several solid seasons of touring Coast-to-Coast behind their eponymous 2012 debut album, Grant Farm and the 2014 follow up, Plowin’ Time (#2 JamBand Radio Charts), audiences everywhere are a-buzz with the Roots, Rock and Cris-Co statement that Grant Farm brings to every performance. In September 2014 Grant Farm collaborated with the band Fruition to release Meeting on the Mountain, which reached #8 on the JamBand Radio charts and #148 on the AMA Radio Charts. You can also stay up to date on news on the new Meeting on the Mountain spcial media feeds twitter.com/MOTMLive and facebook.com/meetingonthemountain.